I used to think about suede and leather as “impossible” fabrics to work with — hard to handle and expensive. That was before I started using them. WOW! Was I wrong! There are soooooo many things that can be done with leather and suede — plus my “Sewing With Leather” book also gives ideas of where to get leather FR*EE! How can you beat a deal like that! Sewing with leather does not take a special machine; however the materials do require the use of a special “leather” needle in your sewing machine. The leather needles are easy to find, so you should be all set up to do some leather projects. 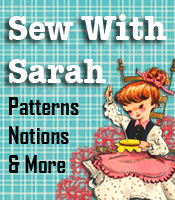 The Sewing With Leather.com site has a couple of books, patterns and kits to get you started. There are easy projects as well as some that are a little more difficult. And, for those who could use some leather chaps, there’s even instructions on how to make your own chaps. Speaking of leather and riding — more and more people are getting into bicycle riding because of the exercise value, in addition to the savings of gas money. If your bicycle seat has gotten a little more than “worn” – like “needs to be replaced or fixed”, I’ve found a tutorial on how to Reupholster your bicycle seat. The instructions are very clear and easy to follow and are posted on the ModHomeEcTeacher’s blog. She’d found this tutorial as an “instructables” project and passed it along in her blog. Now just how great is this??? 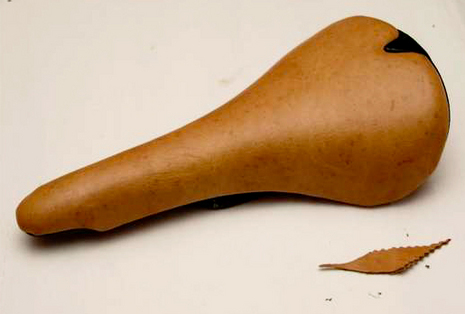 You can keep your bicycle looking new simply by re-doing the seat. I just love the tutorials that help us extend the life of things — save money and have something new at the same time! Thanks a bunch for passing along the tutorial, ModHomeEcTeacher! !